Folder is a container for surveys, polls and sub folders. To create a new folder press the “new sub-folder” link in the Menu box of the current folder. Then name it and add an optional description. 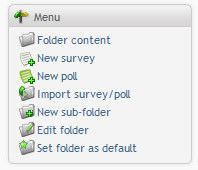 Select a sorting method for surveys, polls and sub-folders in the new folder. Click “Save”. The folder will be created as a sub folder of the current folder. To edit the current folder, click on the "Edit folder" link in the Menu box. Make the changes and save. To delete a folder you need to go one level up, to the parent folder. Click on the Delete link in the Action column in the Sub-folders table. To set the current folder as default folder, click on "Set folder as default" on the left menu.